Tonight we were given a test ride on the newest tour boat from BC Whale Tours a local Victoria Whale Watch Tour Company. This was a thrill of a lifetime! 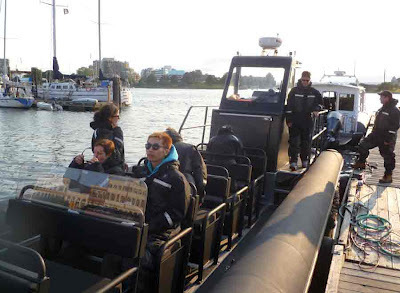 The craft is 40 feet long, handles only 12 passengers and can easily handle rough water. We were out in some pretty good swells and the boat handled it with easel The ride was smooth and comfortable and high speed was a super thrill. You just have to try the Tika! This boat can get you out to the whales much faster than other similar craft, so the range is longer and the time you spend with the whales should be longer as well. There is a washroom on board that will handle a 7 foot basketball player. To sum it up, the ride is impressive, smooth, quiet and has a small carbon footprint. Hal, the owner is very proud of his fleet and especially proud of the Tika he designed. You just have to experience it to know just how good it is! For more pictures, go to our Facebook Page. Check out BC Whale Tours website.